Nine years before his birth, Omar Ouda’s family fled from the Palestinian village of al-Majdal – now the Israeli city of Ashkelon – to Gaza as refugees from the 1948 war. Sixty-five years on, the Ouda family are refugees again, this time from the civil war raging in Syria. After an adult life spent in Lebanon, Saudi Arabia and Syria, Ouda is back where he started – in Gaza. He is one of more than 500 people who have come to Gaza in the past two years to escape the relentless killing in Syria. A third have arrived in the past two months, an indication of the accelerating exodus from Syria which is straining resources in neighbouring Arab countries. The number of refugees reaching Gaza is a tiny fraction of the 1.4 million people who have fled Syria since the start of the civil war, but it could still stretch the already crowded territory. 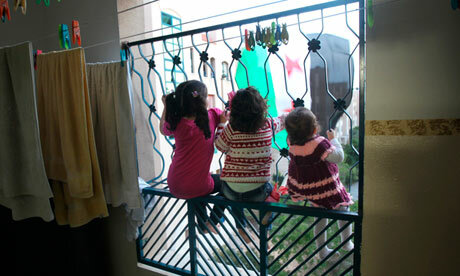 Omar Ouda’s three daughters play with a Syrian rebel flag flying from the window of their apartment in Beit Lahiya, Gaza. Photograph: Mahmud Hams/AFP/Getty ImagesGaza, a tiny and impoverished strip of land whose borders – except for one crossing – are tightly controlled by Israel, is already overcrowded, with 1.7 million people crammed into 139 square miles, smaller than the Isle of Wight. Its residents have endured two short but intensive wars with Israel within four years, in 2008-09 and 2012. But for some of the 487,000 Palestinian refugees in Syria, even Gaza is a more attractive option than the ongoing death, destruction and despair of their present environs. The Ouda family lived in Yarmouk refugee camp, on the edge of Damascus, along with 150,000 other Palestinians. Since the civil war started 85% have fled, according to the United Nations agency for Palestinian refugees, UNRWA, which said last month that those remaining were trapped amid fighting between government and opposition forces. Before the war « life was good », said Ouda, 56. « We had a five-storey house and I had a printing business. Even in the first six months [of the uprising] it was okay. » But then orders dried up, and financial difficulties set in. 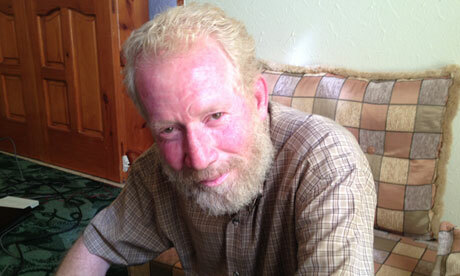 In January 2012, he left his wife, children and grandchildren in Syria to look for work. When the Egyptian authorities caught him without the correct papers, they deported him to his original home of Gaza. Meanwhile, in Syria, the fighting was closing in on his family. Ouda managed to raise the $4,000 (£2,570) necessary for bribe-money from friends and relatives, and nine members of his family joined him in Gaza in March. In the meantime, he found he had escaped one war only to endure another – the eight-day conflict last November between Israel and Gaza. Hamas says it is doing what it can, but the new refugees should be the responsibility of UNRWA. « These people are Palestinian refugees. We understand that UNRWA has a budget deficit, but this is an emergency, » Adwan said. He said Palestinian refugees arriving in Gaza from Syria were given access to education and healthcare and were assessed for food assistance. UNRWA was appealing to its donors for funds to extend cash assistance beyond an initial two months. Ouda said he planned to return to Syria when the regime fell. « I’m not just wishing and hoping that will happen, I’m very confident it will. » He added: « I support the overthrow of all Arab regimes, including Hamas and the Palestinian Authority.